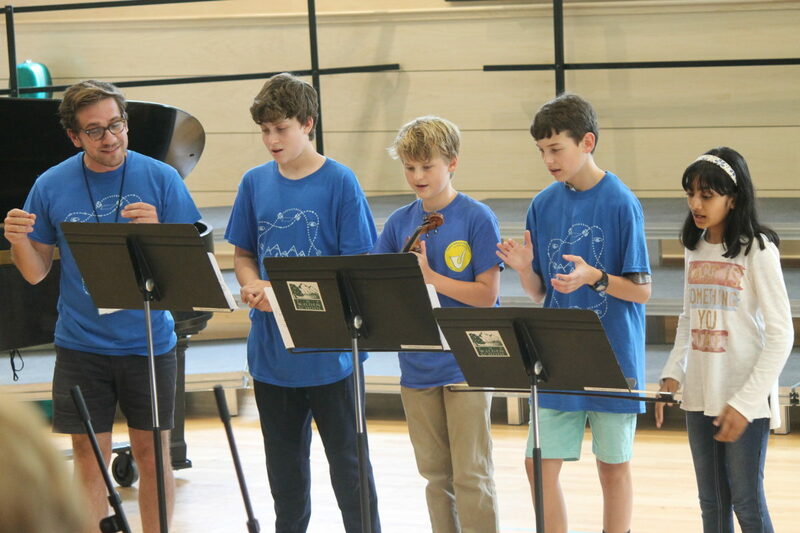 As happens each summer, all YMP students took classes in musicianship and composition. We also offered classes in pop music arrangement, conducting, film scoring, and “Picture This,” exploring the integration of music with visual art, among numerous other specialty classes. One Sunday afternoon, all of the faculty and staff and students went to see Circus Smirkus, one of the premier circus schools in the country. The performers in this traveling circus are about the same age as our YMP students, and share a kindred dedication to craft and creativity. We welcomed four new faculty to the team, including one previous staff member, Brian Fancher. We also added three new staff members, including YMP alumna Nina Kindrachuk, along with our wonderful new nurse Michele Taillon. 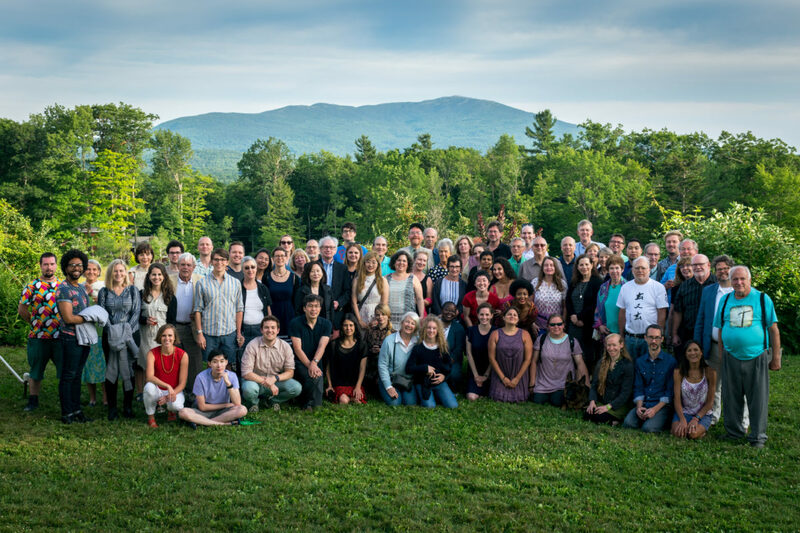 41 participants, ranging in age from 19 to 79, came from 25 states to join us for nine immersive days of composing and learning from renowned faculty and guest artists. Nine of the 41 students were alumni, seven previous CMR students and two YMP alumni. 35 students wrote pieces of music during the program, and our fantastic Composer-in-Residence, Christopher Theofanidis, shared excellent insights with the composers in master classes, three nights of Composers Forums, as well as during private lessons. We offered an evening of chamber music for the first time at CMR, which included a rousing performance of Steve Reich’s Four Organs. The amazing Matt Gold, Steve Beck, and Mivos Quartet were all back in residence this summer, sharing their enthusiasm and dedication to student pieces. The community was strikingly warm this year, infusing everyone with a wonderful esprit de corps. We went hiking up Monadnock on a rainy Saturday, and on our last evening all participated in an open mic night that ended in spontaneous group dancing. Our new CMR choral director at the Creative Musicians Retreat, alumnus Thomas Colohan, did a wonderful job with both the full program choir, which met daily, and the Chamber Choir, which premiered new pieces by four CMR participants. The Washington Master Chorale, the choir that Thomas directs in Washington, D. C., will be performing two choral works by 2018 CMR alumnae Wendy Griffiths and Allison McIntosh on October 28! We also had lively improvisation sessions led by faculty members Loretta Notareschi, Osnat Netzer, Ted Moore, and Alex Christie. Walden’s Summer Concert Series included more than 20 performance, all free and open to the public. The Young Musicians Program had a wonderful opening concert with Aurora Nealand and the Royal Roses, who also taught a workshop about their music to the students. We were fortunate to have a residency with Rajna Swaminathan’s Mangal, a collaboration with Anjna Swaminathan and María Grand. They led a workshop on listening, rhythms, and improvisation, and played a concert of improvised music that harmoniously intertwined jazz and classical Indian music. The YMP Faculty Commissioning Concert featured the International Contemporary Ensemble (ICE), who performed 11 new pieces by Walden Faculty. ICE led a workshop on music by Michael Pisaro, a collaborative, large-group piece using found objects and sounds. Later in the summer, Walden students, alumni, and faculty joined ICE at Lincoln Center in New York on August 9th as part of a 100-person performance of Michael Pisaro’s piece, A wave and waves. Our visiting artists also held community connections concerts at three locations. The Walden School Players performed at Dublin Community Center and Crotched Mountain Rehabilitation Center, and Mangal performed at the Keene Public Library. Walden’s 36th season at our wonderful host Dublin School was enhanced by a new dormitory and administrative building. We particularly celebrated our first season in the remodeled, air-conditioned Louise Shonk Kelly Recital Hall, with a beautiful, spacious stage and excellent acoustics. The renovations meant we were able to perform our annual YMP choral concert on campus for the first time in more than a decade. Long-term collaborator PRISM Quartet performed Color Theory 2.0 in Philadelphia and New York, the 18th year of premiering Walden student pieces. The performance featured YMP alumnus Max Chung, winner of the PRISM/Walden School Commissioning Award. Walden continued a decades-long association with its annual visit to this preeminent artist colony. Students met with three composers—Kate Soper, Jeff Sugg, and Michael Fiday—all of whom serendipitously already had connections to Walden. Vocalist and composer Kate Soper is a past visiting artist to YMP and CMR, as part of the Wet Ink Ensemble. Video and projection designer Jeff Sugg is a long-time friend of our director Seth Brenzel. Composer Michael Fiday has taught a number of Walden students and faculty over the years at the University of Cincinnati. Our students also got to tour one of the MacDowell Colony studios. More than 75 alumni, guests, and board members gathered to celebrate 67 years of creative musicianship and transformative programs. 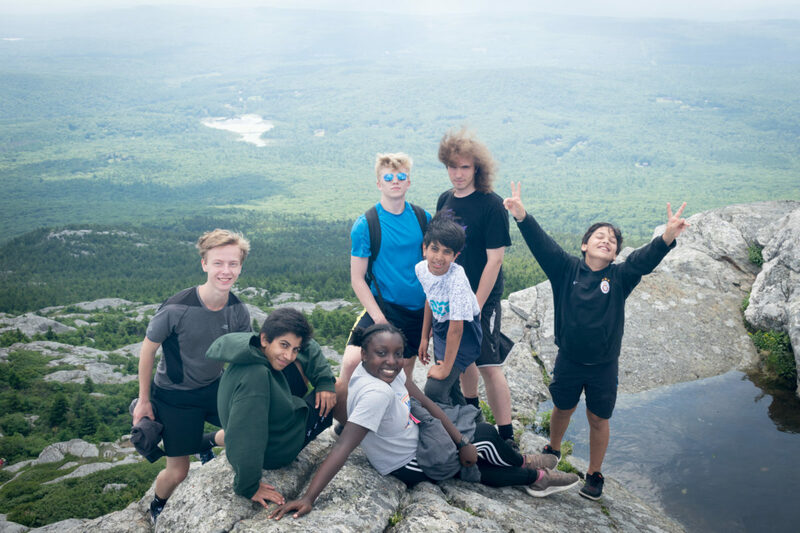 Alumni from the Junior Conservatory Camp, Teacher Training Institute, Creative Musicians Retreat, and Young Musicians Program enjoyed events at the Dublin School campus and at the beautiful Aldworth Manor in nearby Harrisville. Highlights of the weekend included choral singing led by Sarah Riskind, Friday night Goodnight Music, a lively hike up Mt. Monadnock, and classes taught by Sky Macklay, Sam Pluta, and Caroline Mallonée. We also held a Composers Forum and a concert with faculty and alumni performers. 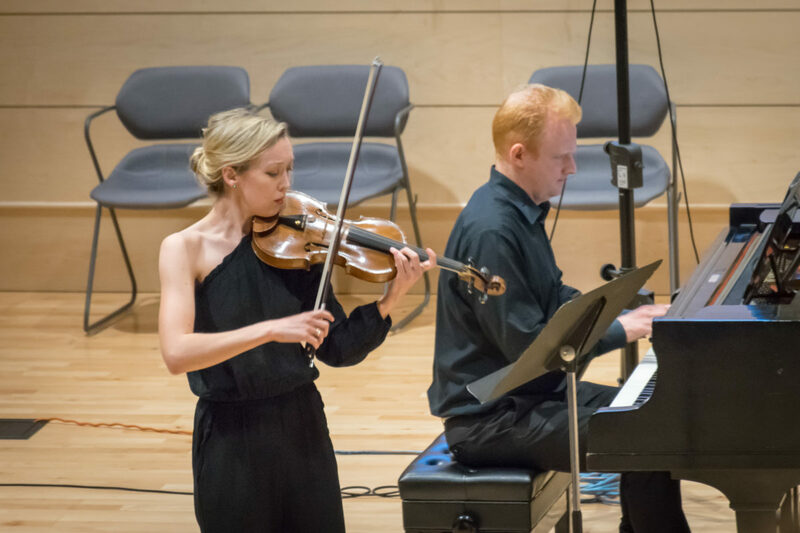 We celebrated Walden with events in Boston, Dublin, New York, San Francisco, and Washington, D.C., featuring world-class performances by Walden alumni. At our Washington, D.C. event, Mackenzie Melemed (YMP ’06, ’07)) performed a piano recital featuring Bach, Medtner, and Dorman. In Boston, Giacomo Baldelli (TTI ’10) played electric guitar. Our New York event featured cellist Dave Eggar (Visiting Artist ’06, ’07, ’11) with guitarist Phil Faconti and vocalist Sasha Lazard. In San Francisco, guests heard an astounding performance by violinist Nigel Armstrong (YMP ’00). Our Augustevent in Dublin featured members of The Walden School Players: cellist Seth Parker Woods, violinist Erika Dicker, and pianist Eric Wubbels. These five events brought together more than 250 friends, alumni, and supporters of the Walden School for celebrations of Walden’s programs and people, and delighting in music and community. The PRISM Quartet Presents Color Theory 2.0!